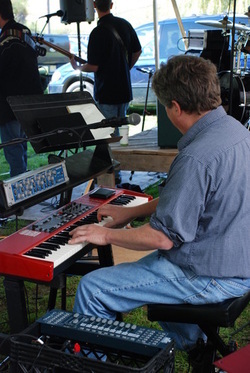 Playing a fall outdoor gig at a farm in Hunterdon County (NJ) with Zero Gravity. For fun, I brought a Fender Rhodes and a tube amp to this one. Getting ready to play at Bernie's. I was using my Triton Extreme that night because my Electro 3 had recently been stolen out of my car. We had 10 people on the 8' x 21' stage that night. I was in the back row holding it down with the drums and bass. At an outdoor event with my Electro 3, the MoFX above it, and the lighting controller on the left side. Here's a vintage photo of The Local Band (at the Show Place in Dover NJ if you must ask). We created some great music together, and along the way I learned a lot about all aspects of performing.